Guest contributor Rogelio Rodríguez and I had somewhat opposing views on Spike Jonze’s Her. I hope we can remain friends, although it is unlikely. Sorry, geeks and hipsters. I know many of you adore this sci-fi drama about a lonely introvert (Joaquin Phoenix) who falls in love with his computer, and by all accounts, I should be right there among you. But Her didn’t completely work for me. Hold on to your tomatoes and hear me out for a sec. I’ll fully acknowledge two things upfront: The film is beautifully shot by cinematographer Hoyte van Hoytema (if Los Angeles really looks like this, I need to move there), and the lead performance by Joaquin Phoenix is, as usual, flawless. These two are reason enough to watch Her. 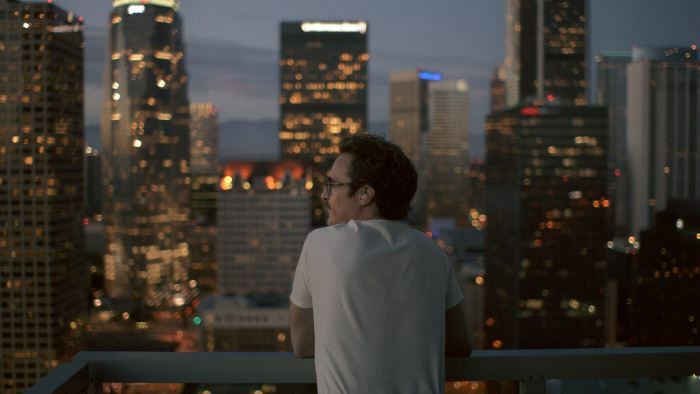 Theodore (Joaquin Phoenix) stares at the City of Angels. My main issue with Spike Jonze’s fourth film is that I just didn’t buy it. I never fully believed that in the near future, a reticent writer like Theodore Twombly (Phoenix) could feel physically and emotionally attracted to Samantha, his computer’s new operating system (voiced by Scarlett Johansson), or that Sam herself could start to feel the same for Theodore. Mind you, I actually think this is a great premise. I even think it’s quite possible that we will develop these sort of feelings with our technology, if we haven’t already. But to me, the execution itself felt too mannered, too artsy for my taste. Her is an interesting experiment that doesn’t completely trust the audience to fill in the gaps. 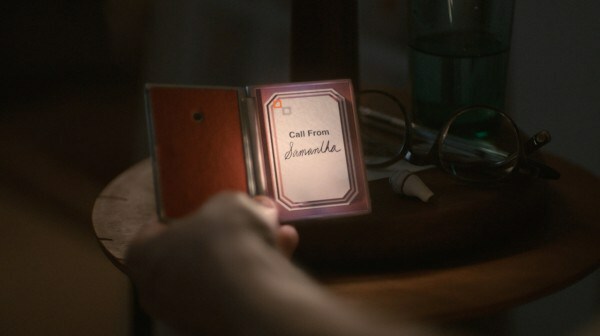 A particularly grating sequence has Theodore’s ex-wife Catherine (Rooney Mara) chastising him about his failure to feel real emotions, opting for a relationship with a gadget instead. Really? I already knew this from Theodore’s job (he’s a writer of intimate letters for other people), his body language, his sad eyes and demeanor, and obviously from his already ongoing romance with a computer. I didn’t need it to be spelled out for me further. Operating systems need love too. For me, there’s just too much talk in Her. The incessant dialogue – about how and why we fall in love and what it all means – ends up killing the mystery of it all. It’s not until the last half hour that Jonze starts to relax: The scenes play longer, the camera lingers on the faces of his characters, the music fills the spaces between words. The film suddenly becomes more haunting, more reflexive. Heartbreak – human and digital alike – gives way to possible growth. I specially liked the final shot of Theodore and his neighbor Amy (Amy Adams), sitting on the roof of their apartment building, at long last ready (perhaps) to make a meaningful connection to each other. If only the whole movie felt like that. Like Jonze’s previous Being John Malkovich (1999) and Adaptation (2002), Her left me a little cold despite its obvious creativity. Its artistic approach stays in the memory… but not the heart. Hey, don’t get me wrong. I still kind of dug it. So before you hurl those tomatoes, following is my friend Rogelio’s rebuttal, which is pretty great (although it may completely end our friendship). Enjoy! What makes a feeling and/or thought real is not the medium or format in which it travels. If it’s true that what we think or feel comes from bioelectrochemical reactions in our nervous system – and not something ethereal and possibly non-existent as the “soul” – then when the computers, robots, operating systems, and any other forms of artificial intelligence reach the same level of complexity (and beyond) of the human brain, we’ll have to acknowledge them as thoughtful, emotional, and self-conscious… just like ourselves. Perhaps we’ll even have to allow them the right to vote. In Her, the relationship between Theodore and Samantha is not like the bond between today’s most die-hard digital aficionados and their gadgets. They may not be able to walk away from their iPhones, but they’re not expecting the machine or its apps to love them back (they may expect that from talking to other humans through the instrument, and perhaps that’s where they’re wrong). But Samantha is not a gadget. Samantha genuinely feels. Yes, she’s programmed to do so… so are humans. The operating systems in Her are inorganic machines, an intentional product of human ingenuity. In contrast, humans are organic machines, an accidental product of natural evolution. Both can feel, and even have thoughts about those feelings (remember the androids in 1982’s Blade Runner?). – It’s also a well-known fact that when humans want to express complex ideas through sound, they do so by being selective and exhaustive in their use of words and tone (since they have to compensate for the lack of body language). If Samantha had been a flesh-and-blood girl who only communicated with Theodore via phone, Her could’ve still employed 80% dialogue and felt believable. Finally, regarding the scene between Theodore and his ex-wife Catherine, I have a completely different opinion than Carlos (in fact, I don’t think I’ll have lunch with him tomorrow). Let me explain. 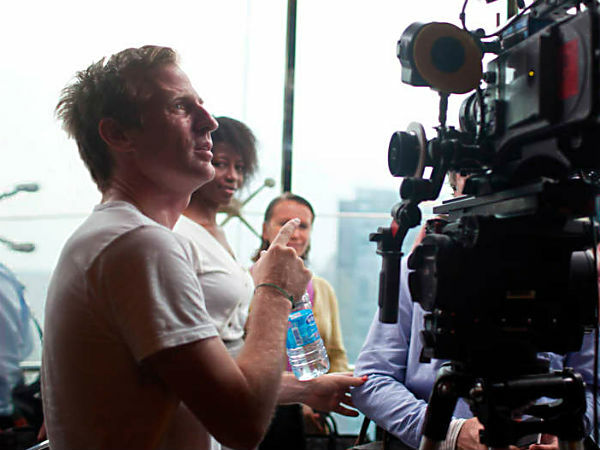 Writer/director Spike Jonze sets up a shot. It’s true that Catherine complains to Theodore that he’s incapable of dealing with real problems and emotions (and yes, it’s already obvious at this point in the film), opting instead for a romance “with his laptop.” But in the brilliant script by Jonze, Catherine doesn’t say this because the audience needs to know it. She says it because she doesn’t understand what Samantha is becoming to Theodore. Theodore is having a real relationship and indeed dealing with real problems and emotions. A romance that started through rose-tinted glasses but is beginning to turn cloudy, and in fact is destined for failure (because, like Catherine says, Theodore does have issues). And that’s the point of the scene. Catherine doesn’t realize the depth of Theodore’s feelings. She’s prejudiced against relationships with OS’s (and perhaps Carlos is too?). * And because she has more capacity to process information, Samantha can interact with 8,316 people at the same time… that’s so cool! ** He can help others express the deepest feelings, but he can’t do the same with his own… that’s so cool!